Engineering student organizations emphasize teamwork while developing valuable communication and leadership skills. Many mechanical engineering students are involved in the following. SIUE Cougar Baja students design and build an offroad car that can endure rough terrain including water. The students work together as a team to find and solve technical challenges in design, testing, manufacturing and business issues. Every year, the team designs and builds an all-weather, single-seat, off-road recreational car and participates in various competitions. The team has currently about 20 enthusiastic members and meet regularly to prepare for competitions. The team is stationed in the first floor of the Student Design Center. "SIUE Formula SAE is a student club whose main purpose is to organize SIUE students to manufacture a racing car per SAE Formula specifications and use the designed car to participate in student design competition organized by SAE International. The annual competition has a long history since 1980s. In each design competition, the entry car is scored in the following areas: Presentation, Design, Cost, Acceleration, Skidpad, Autocross, Fuel Economy and Endurance." American Society of Mechanical Engineers (ASME) was founded in 1880 and has approximately 140,000 members world-wide. The purpose of the SIUE student branch is to give Mechanical Engineering students the opportunity to learn about the Mechanical Engineering field via hands-on experience. 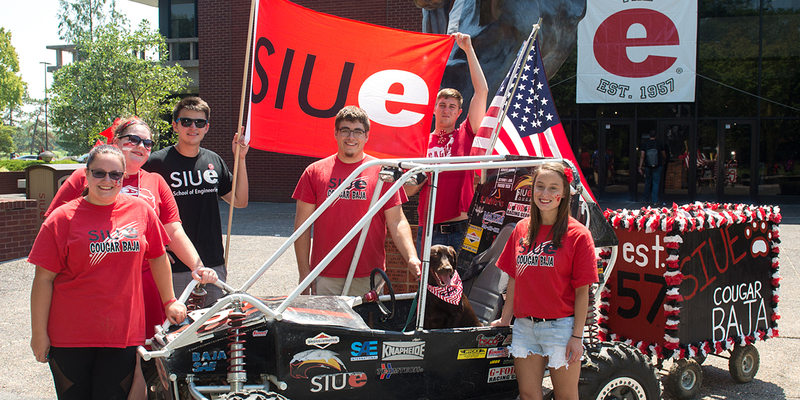 SIUE is an active participant in the Human Power Vehicle Challenge (HPVC). Members develop their engineer and team skills by designating, analyzing, fabricating and testing a unique and original Human Power Vehicle. Students also have opportunities for networking and presenting technical topics to other professionals in the St. Louis chapter of ASME. The Autonomous Robotics Club is a group that allows further involvement in the field of robotics regardless of a student's discipline or experience level. It will expand the club member's knowledge of robotics through comprehensive meetings providing presentations and hands on learning with various robotic platforms. Additionally, the club serves as the overhead group for individual robotic competitions. Drone Club of SIUE is a multidisciplinary engineering organization with the goal of researching and developing drone technology. While Drone Club seeks to enhance the academic field of drone technology it also holds the hobbyist ideals in mind. Among the key tenets of Drone club are; have fun, learn practical skills, gather like minded people, and learn about drone technology. Drone Technology for us is centered around flying drones, specifically quadcopter drones. Flying drones offer a wide variety of engineering and hobbyist challenges which the drone club is well suited for exploring. Specifically the Drone Club is interested in developing projects that center on how drones can be used to improve scientific research and how they can be used in everyday life. At the request of mechanical engineering students, the department submitted a petition to the National Pi Tau Sigma for the SIUE Alpha Chi to be chartered. The first initiation eremony was performed on May 1, 2003, and a number of university administrators, faculty, and students attended. In that ceremony, fifteen students were inducted to membership. Since that time, our program and students have benefited from the activities of the Honor Society in various forms. Students perform fundraising, engage in team work, and promote the ideals of mechanical engineering on campus and among the general public. More recently, officers of SIUE Alpha Chi were able to develop, plan, and implement a teaching day with a middle school in the area to generate engineering interest among middle school students. SIUE Alpha Chi has created a close-knit group that is willing to assist each other when the members are in need of assistance. Since the first initiation ceremony in 2003, many members have graduated and left the school. SIUE Alpha Chi continues to attract new members and creates an environment where students practice teamwork and service to the university and society. American Society of Heating, Refrigerating, and Air-Conditioning Engineers (ASHRAE) is a professional organization that was founded in 1894. Today, it has more than 50,000 members. The organization focuses on all aspects of heating, ventilation, air conditioning and refrigeration to improve quality of life while promoting a sustainable world. These feats are accomplished through research, developing codes and standards, publishing, and continuing education. Since these goals are aligned with those of School of Engineering at SIUE, a university chapter was formed to provide exposure for students. SIUE Student Branch of ASHRAE was established in Fall 2010. Members of the chapter are also encouraged to become student members of the national ASHRAE organization. The main activities of the student chapter include; arranging lectures and presentations given by HVAC professionals, organizing facility tours, recruiting new members, and running fundraising events. Through design projects, regional and national meetings involving a multitude of professional engineers, and speakers at the monthly SIUE chapter meetings, members are granted access to a virtually endless supply of resources to improve their skills and broaden their knowledge base. Strong faculty support has helped tremendously with the launching of the organization and will continue to aid in its future needs. ASHRAE-SIUE has become a prominent figure in the engineering community of Southern Illinois University Edwardsville.